According to the National Standard Guidelines of the National Marine Fisheries Service, a regional fishery management council’s ACL for a stock may not exceed the acceptable biological catch (ABC) recommendation of the council’s Scientific and Statistical Committee for that stock. 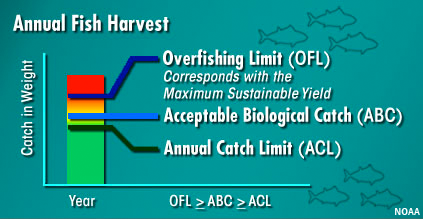 The ABC is a range of allowable catch for a stock that incorporates consideration of the stock’s life history and reproductive potential, vulnerability to overfishing, and uncertainty associated with factors such as stock assessment results, time lags in updating assessments, retrospective revision of assessment results, and projections. The National Standard Guidelines allow a council to divide an ACL for a stock into sub-ACLs a multispecies sector ACLs, which determine the annual catch entitlements (ACEs) allocated to sectors in the Northeast Multispecies Sector Program. 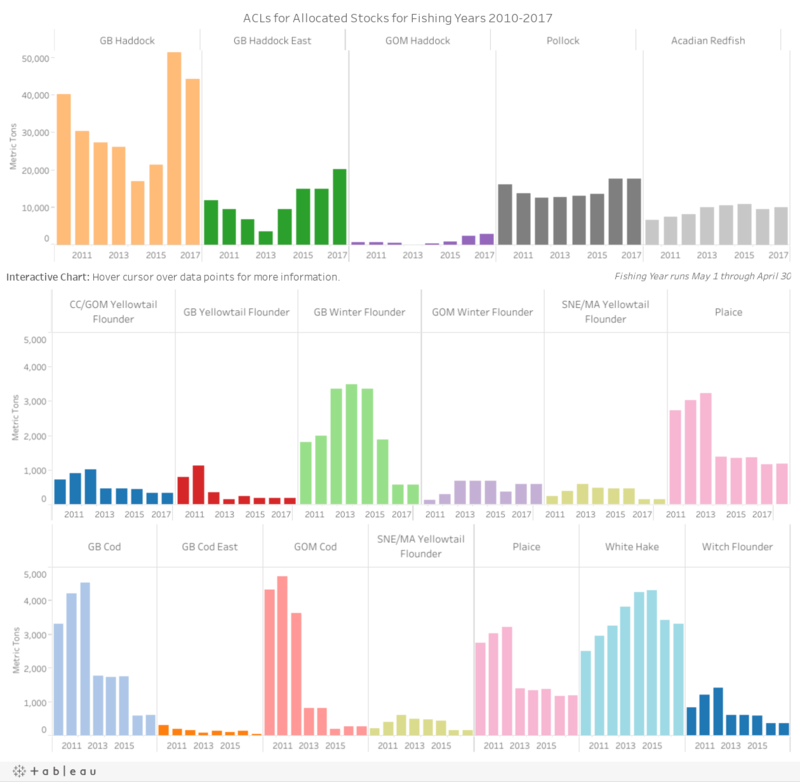 The charts provided below show the sector allocation of ACLs for allocated stocks in the Northeast Multispecies Sector Program from fishing year (FY) 2010 through 2017. Catch share programs do not directly affect decisions about ACLs, but indirectly affect those determinations because catch share programs are typically implemented coincident with enhanced catch accounting and monitoring requirements, which can reduce management uncertainty and scientific uncertainty. Provisions of the Northeast Multispecies Sector Program, including the AMs listed below, together with the increased levels of at-sea observer coverage, are expected to contribute to a reduction in uncertainty. However, the ACLs for many stocks have been cut since the implementation of the catch share program: eastern GB cod (-85.5 percent), western GB cod (-81.9 percent), GOM cod (-93.7 percent), GB yellowtail flounder (-74.1 percent), CC/GOM yellowtail flounder (-55.3 percent), American plaice flounder (-56.5 percent), GB winter flounder (-67.9 percent), SNE/MA yellowtail flounder (-35.6 percent) and witch flounder (-56.3 percent). In several cases, overfished stocks have not responded to rebuilding plans (Biomass). For seven stocks (including all haddock stocks), ACL was higher in FY 2017 than in FY 2010. “These other guys, they’ll throw choke species fish overboard all day long. And they’ll sleep just as good that night, as if they’ve done nothing. And that’s the bottom line. If a sector remains operational following an overage, but does not have sufficient allocation to cover the overage, vessels participating in that sector will be prohibited from fishing the stock areas associated with the overage until the sector acquires sufficient allocation to cover the overage of that stock for the stock area in question.